One of Doctor Who's most notorious villains has been found inside of a UK school, with no explanation or rightful owner in sight. What happens to a Dalek once defeated by Doctor Who? Well, apparently it can either just rot in place, or accidentally re-materialize in an educational center to the surprise of everyone around. The latter might seem the most unlikely, but it's actually the only one proven to have happened outside of a television screen. A Dalek was recently found in the West Exe Learning Centre in Exeter, UK, with absolutely no explanation of how it got there, or why. While the pre-school aged children from the center were initially excited about their strange find, faculty are itching to know who it belongs to. 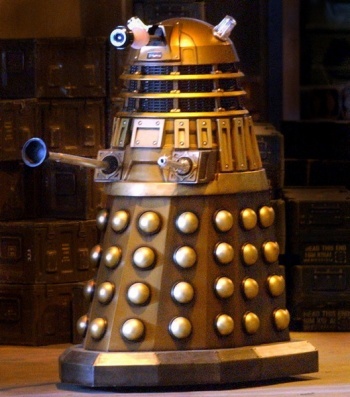 Nobody has stepped up to claim ownership of the Dalek, which is only more mysterious because of how well made it is. Standing five feet tall and big enough to sit in, the Dalek isn't a piece of junk despite some exterior damage. "He's a little bit damaged here and there, but he's still got to be worth hundreds," Sue Wiley of the Learning Centre said. The discovery is not unlike when a Dalek head was found in a pond. If someone got their hands on the official Dalek blueprints and built one of their own, it'd be odd to set it free like this. Exeter police have had no reports of a stolen or missing Dalek, so they're baffled as well. In the interim, a film and television memorabilia store owner stepped up to claim the Dalek for display in his store so that the school can make room in its cupboard again for things that aren't a Dalek. I can see how a free, life-sized Dalek might have seemed appealing to the store owner, but once the rest of it teleports into its shell and goes on an extermination spree he's unlikely to be a happy camper. At least it can be killed with a couple of earplugs and a Wii Remote when it does end up coming to life someday.